One of the sins you can commit in writing a term paper or thesis is placing too many parenthetical notes on a page. Many professors appreciate it when you instead use footnotes. 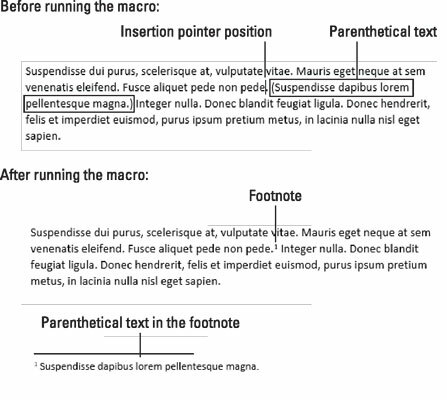 You’ll also appreciate the parenthetical_to_footnote macro, which automates the process. Keystrokes were used to record this macro, but the insertion pointer must be precisely positioned for it to work: Click the insertion pointer before the parenthetical sentence, just before the period where you want the footnote to appear. The figure illustrates the positioning and the result after running the macro. Press F8 and then the ( (left parenthesis) character. The F8 command enters extended selection mode. When you press a key, such as the ( key, text is selected up to and including that character. Selection is canceled, and the → key moves the insertion pointer to the start of the parenthetical text. Text is selected up to and including the ) character. The ) character is removed from the selection. The parenthetical text is cut. The next few keystrokes remove the parenthesis and position the insertion pointer for the footnote. Click the References tab and, in the Footnotes group, click the Insert Footnote button. The text is pasted into the footnote.